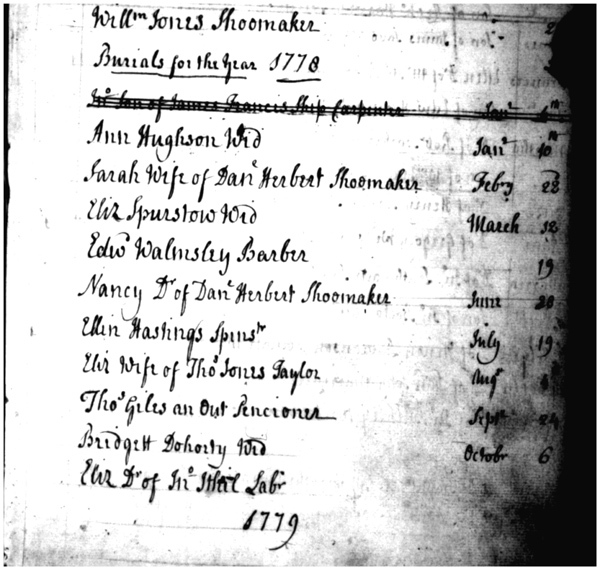 Copy of parish burial record for Elizabeth Hayes/Heays Spurstow, buried 12 March 1778, St. Martin's Church, in Chester, Cheshire, England. Elizabeth was the widow of George Spurstow, an apothecary in Chester who died in 1770, eight years earlier. Elizabeth, the daughter of George Hayes and Elizabeth Bagnell, according to family trees, died intestate. Her daughter, Mary Spurstow Miller was appointed to administer the estate. Elizabeth was the second wife of George Spurstow; his first wife, also an Elizabeth, was buried in 1753. Parish registers: St. Martin's Church, Chester, Cheshire, England, 1671-1963, FHL MF 1999761, Item 6, Baptisms, burials, 1744-1797.